The Shakori Indians were one of several small tribes that occupied the Piedmont region of what is now North Carolina during early English colonization. The prehistoric origins of the Shakori are unclear. During his 1711 expedition against warring Tuscarora Indians and their allies, South Carolina Indian fighter John Barnwell claimed that the Shakori and Sissipahaw were identical. During his 1650 exploration of the Virginia-Carolina Piedmont, Edward Bland identified the land between the Meherrin River and the head of the Nottoway River as the "rich old fields" of the Nottoway and "Schockoores." Although Bland did not indicate the location of the Shakori or their relationship with neighboring Indians, the tribe appears to have migrated farther south by 1670. German explorer John Lederer noted in 1670 that the Shakori were among various tribes located along the Eno River in North Carolina. The tribe may have relocated to this area for both cultural and security reasons. According to Lederer, the Shakori shared similar customs and manners with the neighboring Eno tribe. They also may have sought stronger diplomatic and trade ties with the Eno Indians in order to resist being dominated by the powerful Tuscarora, with whom they periodically fought. By the early eighteenth century, at least one group of Shakoris was living with the Eno Indians at the town of Adshusheer on the Eno River. 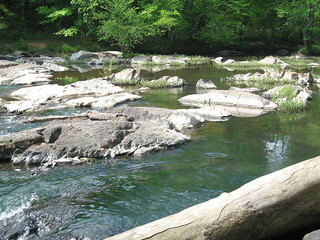 The Sissipahaw were located close by on the Haw River. The Shakori-Eno merger occurred on a political as well as cultural level. According to English surveyor and trader John Lawson, the "Shoccories" and the Eno shared a common chief known as Eno-Will. By the time Lawson came into contact with these tribes in 1701, the Indians of the Carolina Piedmont were well within the orbit of the Virginia-Carolina skin and fur trade. Lawson described trade between the Shakori and Tuscarora Indians who probably came from the latter's northern villages. Increased contact with English colonists and traders apparently caused divisions within the Shakori. Eno-Will informed Lawson that his affection for the English had alienated the Anglophobes in his tribe, causing him to fear for his life. The Shakori's involvement in the skin and fur trade and their close association with the Tuscarora Upper Towns may explain why they played little if any role in the Tuscarora War of 1711-13. On the other hand, South Carolinians accused Eno-Shakori villages of aiding warring Yamassees in 1715. The absence of references to the Shakori after 1715 suggests that they, like other small tribes in the Carolina Piedmont, were assimilated within more powerful neighboring tribes. The Eno and their "confederates," who probably included the Shakori, petitioned the Virginia government in 1715 to settle with the Saponi Indians at Fort Christanna. Between 1736 and 1743, the ethnically diverse Eno migrated to the Catawba River, where they joined forces with the Sissipahaw and other displaced Indians to form the powerful Catawba Nation. H. Trawick Ward and R. P. Stephen Davis Jr., Indian Communities on the North Carolina Piedmont, A.D. 1000 to 1700 (1993). "Eno River." The Shakori Indians lived along the river. Image courtesy of Flickr user Todd Martin, uploaded May 6, 2006. Available from http://www.flickr.com/photos/tmartin/146338578/ (accessed May 23, 2012). 1 January 2006 | Devine, Christine S.
I really like this website! I really like this website! It helped me with my project for school!